The AGM-158 Joint Air-to-Surface Standoff Missile (JASSM) is an autonomous, long-range, conventional, air-to-ground, precision standoff missile for the U.S. Air Force and Navy. JASSM is designed to destroy high-value, well-defended, fixed and re-locatable targets. JASSM’s significant standoff range keeps Air Force and Navy aircrews well out of danger from hostile air defense systems. The missile’s mission effectiveness approaches only a single missile required to kill each target. JASSM program was initiated in 1995. Development goal was a low-observable long-range precision guided stand-off missile for significantly lower cost than the TSSAM. In 1998, Lockheed Martin won the development contract for the JASSM. The JASSM is a stealthy cruise missile powered by a Teledyne turbojet engine. It used flip-out wings with control surfaces and a single vertical tail for flight control. It is guided by a jamming-resistant GPS-aided INS, and uses an IIR (Imaging Infrared) seeker for autonomous pattern-based target selection and terminal homing. The missile is armed with a 1000 lb WDU-42/B insensitive munitions penetrating warhead, and accuracy is quoted as around 8 ft CEP. Testing began in 1999 at Eglin AFB and White Sands Missile Range, NM. The AGM-158A was finally certified as ready for operational use in October 2003, and could be employed operationally by the B-52. Tests and development has begun on an upgrade which has been designated the AGM-158B with the contract being awarded in 2004. 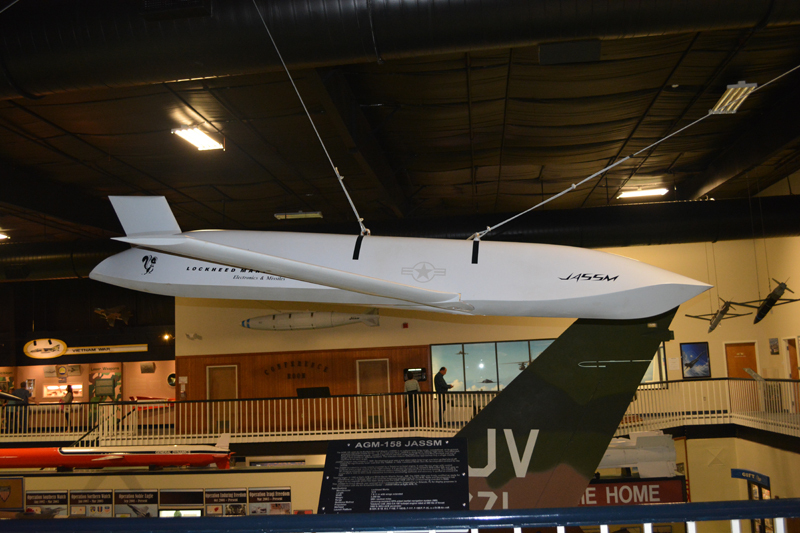 This JASSM Fit Check Missile was received from Lockheed Martin Corporation in Orlando, FL for display purposes in coordination with the Air Armament Center – JASSM Office at Eglin AFB, FL.